Empathy is not just another obscure human virtue. Empathy is one of the most powerful yet underrated qualities that can truly change the face of the world. It promises world peace, brotherhood and true happiness. In truth, empathic people not only build a better life, but also build a more stable future and more enduring relationships for themselves. It is one of those qualities that mean win-win for everyone. History proves that while humans are capable of great acts of kindness, love and sacrifice they are also capable of unfathomable acts of cruelty and barbarism. Heinous crimes have been committed over the centuries against the downtrodden, poor and weak. These crimes may well have been set off by a few select demagogues around the world, yet the reason these crimes took the shape of wars and genocides is because thousands of people were brainwashed into joining the war against humanity. Sometimes, the only thing standing in between a human and a human capable of committing monstrous acts is Empathy. Empathy is the power to place oneself in another man’s shoes, and to view the world from his perspective. Empathy is the realization of the presence of good in oneself as in another. It puts the “me” on an equal plane level with “you” so that now we are on the same ground level to breed love, respect and friendship. In this respect, Empathy is markedly different from pity. Pity is a negative emotion; it immediately puts “me” on a higher pedestal than “you” being the object of pity. Pity can only breed hatred and contempt in the long run. Any help given out of pity may help the recipient in the short run, but in the longer run will impede his growth as it will be a blow to his self-confidence. Furthermore, it will cause derision in the heart of the recipient and erode your relationship. Never do an act of kindness out of Pity. For Pity does not equate to kindness. But we live in a materialistic world and have become accustomed see everything from the point of view of “What’s in it for me?” A fair question. There is more to be gained for the individual practicing empathy than the altruistic ideal of becoming a beacon of light to the world. Empathy and Emotional Quotient have a deeply symbiotic relationship; one breeds on the other. And while a person’s intellect and success in academia may get you your dream job, believe it or not, it is Empathy that will win your alliances with influential people, and increase your chances of success at work. No matter how intelligent and capable you are, the truth is your capacities alone will amount to little. To do big things, you need a strong support from your colleagues. Empathizing with your associates improves your relationships and builds mutual trust and alliance. Any workplace where people do not trust or respect one another cannot be conducive to growing mentally or nurture ideas. The more respect you give the more you will see it coming back, something that can only be attested by those who practice it. When faced with making difficult situations or passing judgment on others, take a moment to step back and place yourself in the other person’s shoes. If we have the capacity to place ourselves in the shoes of the very people we ridicule or deride, we will slowly lose our hatred towards them. If you like to be appreciated for a job well done, then appreciate others. Take a moment to appreciate the friend who opens the door for you at your office, or the person at Starbucks who hands you the coffee. If someone honks at you rudely on your drive to work, force yourself to give them a mental hug. Even if it does not change your relationship with that person, it will give your mind a shot of feel-good hormones. But here is another important aspect of empathy. While it is important to respect the good in others, never underestimate the good in yourself. For you can only project outside what you feel inside! Also remember that being empathetic does not mean putting your own needs of self-respect secondary to others. Again, empathy puts two people on the same ground level, not one higher than the higher. Committing or accepting any act of injustice towards anybody including yourself is wrong. While it is wrong to hurt others, it is equally wrong to accept any abomination, indignity and unjust behavior, no matter who the source of the injustice is. Stand up for yourself, irrespective of the consequences, and if that does not work, remove yourself from the source of injustice. There is plenty of good and kindness in this world, position yourself in places and midst people you can channel it. Empathizing is an invisible ladder into someone’s heart. If we are truly all made in the form of God, then empathy allows us to see Godliness in ourselves and others. 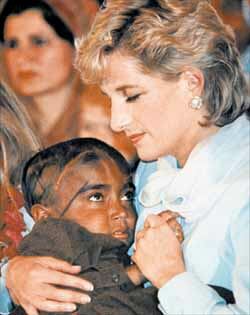 This picture was taken from http://www.biographyonline.net/people/diana/charity_work.html an article that showcases the philanthropic works done by Princess Diana. Again, you inspire me. Thank you. I’ve been trying to explain to people for years that the more I get to know a person the more I love them, even if their actions are abominable. What I’ve been neglecting to say is that it is because I can empathize. I try to figure out why a person would behave in such a way. I put myself in their shoes. It is usually pretty obvious why people act the way they do when you can empathize. For example, people lash out at each other when they are in pain (and it’s unfortunately often the nearest person around, which is often the people we love the most). Anger is a secondary emotion. Pain is a primary emotion. Pain leads to anger. So, if someone is angry they are in pain. It’s that simple. We’ve all been in pain, and emotional pain has been scientifically proven to be as just as real and detrimental (though in different ways) to the human psyche as physical pain (perhaps more). So if you have ever been in pain you can understand why other people get angry and do or say stupid things. It doesn’t mean you’re suddenly best friends, but it may stop you from escalating an already bad situation at the very least. Long story short, don’t just listen to this woman, hear her. She understands. Can you empathize? Try harder. Do a better job of it. We all need it. I do agree. Empathy is the greatest virtue of human beings which unfortunately due to selfish reasons one forgets it. In fact, even in any creature this emotion plays an important role. Animal beings and even plants being also have this instinct, that is why they survive even in worst circumstances. Anger of course is off shoot of self pride which do’nt give any room for empathy. This must be controlled and curbed. So important, I think, to understand the difference between empathy and pity. Thank you dear “Chasing Butterflies” for your very kind words on my post, and especially for sharing your own thoughts and story about Empathy. As an artist you will be able to understand, people who succeed are not always the smartest but the one’s who can empathize with the masses. Empathy is a true win-win! Love!!! I am a new beauty blogger and would love for you to follow me, give me any tips and comments on my page:) love your site! its beautiful! Thank you and glad to help 🙂 I always need beauty advise myself, and please feel free to share your kind opinion and advise on my my blog. Thanks. awesome!!! I will be featuring artist of the week that consist of Makeup and Hair stylist 🙂 can’t wait to hear from ya!